(Moscow News – themoscownews.com – Natalia Antonova – June 3, 2013) The departure of Sergei Guriev is ultimately an illustration of what happens when powerful institutions steadily lean toward the irrational. To recap, Guriev is an economist who co-authored a report that criticized the treatment of imprisoned tycoon Mikhail Khodorkovsky. When Prime Minister Dmitry Medvedev was president in 2008-2012, Guriev wielded major influence. 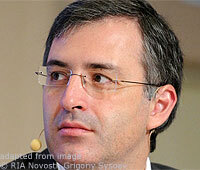 At present, people like Guriev are out of favor. After being repeatedly questioned over his report, Guriev was made to understand that he could also be imprisoned. He recently fled the country, resigning from his post as rector at Moscow’s New Economic School and officially “vacationing” with his family in France, but with no foreseeable plans to return. Liberal commentators have been saying that Guriev’s treatment was ordered from above, and used as a demonstration of loyalty to the Kremlin by high-ranking law enforcement officials. Yet the very fact that such officials are allowed to target people like Guriev with impunity is the direct result of a lack of accountability on all levels of the so-called silovik institutions. It’s very doubtful, for example, that the investigators who put such pressure on Guriev will be in any way reprimanded, least of all suspended or fired. They are waging a one-sided battle against soft targets here, and they do not answer to the public. Of course, the siloviki have their own version of events, and claim that Guriev was paid off to write his report. I suppose all of this is a sign of the times we live in. There is very little rationality behind the targeting of Guriev either way you see it. All it did was bring bad publicity. I personally have all sorts of bones to pick with Russia’s liberal economists, but that doesn’t mean I think they’re automatically criminals. But we are beyond the rational here. A reactionary system only grows more reactionary over time, or so it would appear. It makes me curious: what will happen next? Curious and more than a little anxious, that is.